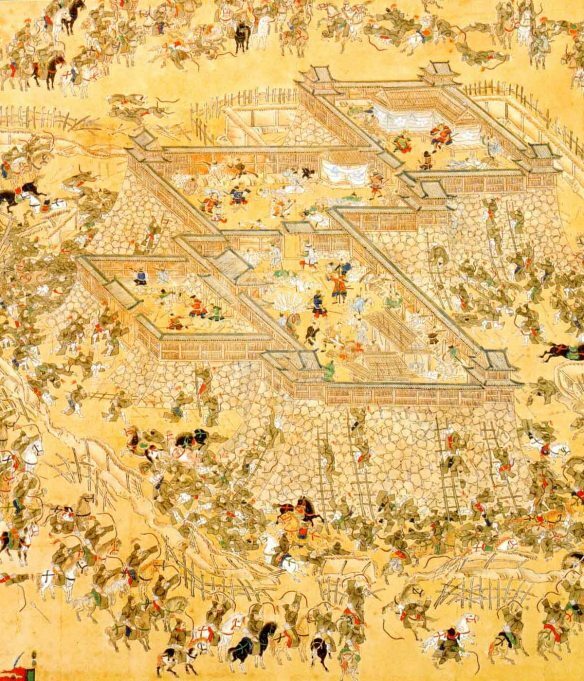 Korean and Chinese soldiers assault the Japanese-built fortress at Ulsan. The Siege of Pyongyang probably saw the largest use of artillery in the 16th century, as the Chinese had amassed an arsenal of 200 pieces of various types of artillery, including rocket arrows, breech-loading cannon and several large caliber "Great General" cannons (Although Song Yingchang's letter claimed that the Great Generals did not reach Pyongyang in time as they had intended). Both armies used state of the art firearms and cannons. 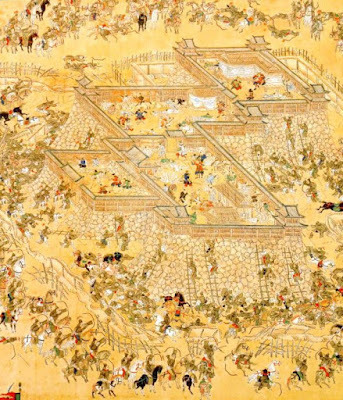 Although guns were widely available in the struggle for supremacy in China during the mid-fourteenth century, they became a cornerstone of the Ming army only after the Ming conquest of China. Before the end of the fourteenth century, almost 10 percent of the army’s 1.2–1.8 million soldiers were armed with guns. The capital’s arsenals produced 3,000 cannon and 3,000 handguns annually from 1380 to 1488. These weapons were widely deployed and initially gave Ming armies an advantage over neighboring states that were not so armed. European advances in gun technology were quickly adopted in China, and the cannon it brought into the field owed as much to the West as did the Japanese army’s muskets.